Wednesday 7th of November started early for me as I had to take the train at 6am in Zürich to be in time in Yverdon-les-Bains for the beginning of Application Security Forum – Western Switzerland 2012. 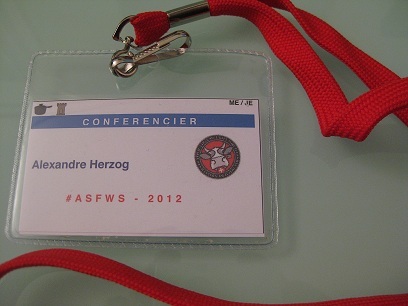 This annual security conference, regrouping all actors of the French part of Switzerland during 2 days, invited me to held a workshop regarding our Hacking-Lab. Unfortunately, the workshop planned on Tuesday 6th, had to be cancelled due to an insufficient number of participants. The social and networking part of the event started for me even before reaching Yverdon-les-Bains, as I met a former colleague in the train in Neuchâtel. It continued before the starting key notes of the conference, while enjoying some coffee and croissants within a hall of the Y-Parc, which was the central gathering place all over the 2 days of the conference. After a few welcome words from the organization staff, we got some news from the authorities and of the HEIG-VD, a partner University of Applied Science which is established here in Yverdon. Its representative, Jürgen Ehrensberger, presented us quickly the competence center and reminded us that the first graduates with a Bachelor in Information Security will finish their studies in summer 2013. Thank you for sharing. Looking forward to seeing your summaries from the presentations. My pleasure Olivier – the next articles will be publish at a daily rhythm, the keynote about Facebook being now online at http://blog.csnc.ch/2012/11/asfws-keynote-1-gestion-operationnelle-de-la-securite-logicielle-sur-la-plateforme-facebook/.